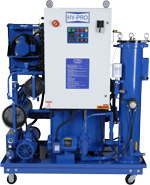 Progressive Power & Control sells Hy-Pro absolute interchangeable hydraulic filters and housings, Hy-Pro "Vac-U-Dry" vacuum dehydrators and the full line of Hy-pro hydraulic filtration products. Hy-Pro G6 Dualglass upgrade replacement elements cover the global spectrum of filter OEMs. Hy-pro breathers remove water and particulate contamination as from the air that systems breathe.